Both of our PyPy talks has been accepted for Pycon US 2009. Although both are somehow related to PyPy, they're vastly different in topics, attitude and target audience. The first one is a classic PyPy status talk - we'll mostly talk about our achievements from the last year (readers of this blog are aware of most, but not all :) as well as some general introduction and plans for the future. See you at Pycon 2009! In my two previous posts, we talked about the PyPy JIT generator, seeing that it can produce huge speedups and how its backend-independent frontend works. In this post, we will look closer at the internals of the CLI JIT backend; in particular, we will see how we work around some serious limitations of the platform, and why these workarounds didn't have any serious impact on the performances of our toy virtual machine. 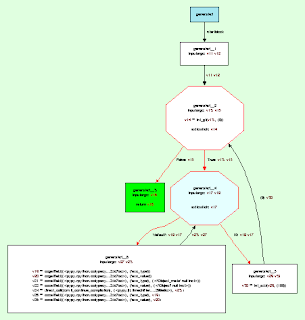 One of the core aspect of PyPy translator is the concept of flow graph: a flow graph is a data structure that represents the code we are operating on. It is composed by a set of basic blocks, each block containing a sequence of operations; blocks are connected together by links, and each link can carry a variable number of arguments whose value is passed to the target block. In case a block contains more than one outgoing links, the one to follow is selected by looking at the value of a designated variable (the exitswitch), thus making possible to implement conditional jumps. 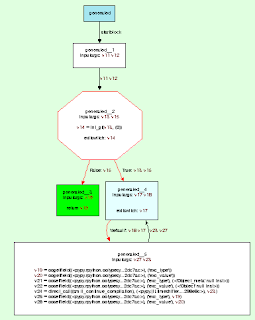 To have a more complete description of the flow graphs model, check the documentation. As we saw in the previous post, the generated JIT compiler makes heavy use of flexswitches to generate efficient code, continuously intermixing JIT-compile time and runtime. In the images above, the block containing the flexswitch is colored in cyan. In the first picture, there is only one block connected to the flexswitch: this block contains the code to restart the JIT compilation. The second picture shows the graph after the first case has been added: you can clearly see that a new block has been created and attached to the flexswitch. Finally, the third picture shows the graph after a while, with a lot of new blocks attached. Conceptually, the goal of the CLI JIT backend is to express these graphs in terms of CLI bytecode. Translating the single block is easy, as it is just a list of sequential operation, and it's straightforward to map each operation to the equivalent CLI opcode or to a call to a helper method. Moreover, we need a way to express links between the various basic blocks: if the links are known in advance, render them is as easy as emitting a (potentially conditional) jump to the target block. Thus, we won't discuss this part in detail, as it is quite straightforward. The hard part is how to implement flexswitches: at the time when we are emitting the code, some of the blocks of this growable graph don't even exist: how can we make a jump to a non existent block of code? For backends that emit assembly code, it is rather easy: when they need to add a new case to the flexswitch, they can just patch the existing code to insert a jump to a newly allocated area of the memory, where the new code is being generated in. For CLI this approach is not feasible, as the VM will never allow us to modify existing code. Thus, we need to think of a different approach. In .NET, the basic unit of compilation is the method: the only way to execute some bytecode is to wrap it into a method. Moreover, it is not possible to execute a method until it has been completed, and after this point it is no longer possible to add new code. Because of all these constraints we cannot simply map each graph to its own method, since we saw that our graphs can grow after they have already been executed few times. 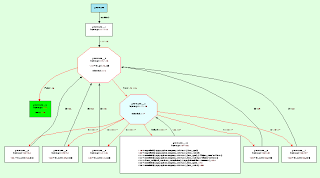 a method is a collection of basic blocks; each method has the so called parent graph, i.e. the graph its blocks logically belongs to. The first method of a graph is called main method (which has nothing to do with the Main static methods found in .exe files); other methods are called children methods. When we want to add a new case to the flexswitch, we create a method containing all the new code; then we wrap the method inside a delegate (the .NET equivalent of a function pointer) and pass it to the flexswitch, so that it can later invoke it. Using this approach, after a while the blocks of our original graph are scattered over a lot of different methods; however, there are no constraints about how these blocks can be linked together, so it happens to have links between blocks which are not in the same method. In the following, we will refer to them as non-local links. If the non-local block we want to jump to happens to be at the beginning of its containing method, it is enough to invoke the method; but, what if we want to jump somewhere in the middle? What we really want is to produce a method which has multiple entry-points; again, doing it in assembly would be trivial, but the virtual machine does not provide any support for it, so we need a work around. 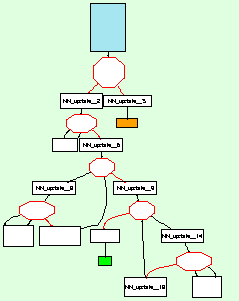 Each method in a graph is assigned an unique 16 bit method id; each block in a method is assigned a progressive 16 bit block number. From this two numbers, we can compute the block id as an unsigned integer, by storing the method id in the first 16 bits and the block number in the second 16 bits. By construction, the block id is guaranteed to be unique in the graph. The following picture shows a graph composed of three methods; the id of each method is shown in red, while the block ids are shown in red (for the method id part) and black (for the block number part). The graph contains three non-local links; in particular, note the link between blocks 0x00020001 and 0x00010001 which connects two block that resides in different methods. 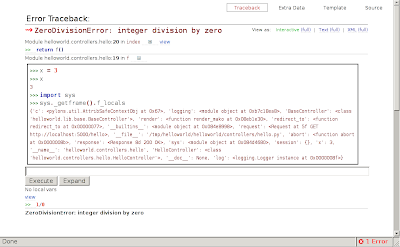 Every method contains a special dispatch block, (not shown in the picture above) whose goal is to jump to the specified block number inside the method itself. The first argument of a child method is always a block id; when the method starts, it immediately jumps to the dispatch block, and thus to the desired block. Whenever we want to jump to a non-local block, it is enough to store the block id in the appropriate variable and jump to the dispatch block. If the block resides in a different method, the jump_to_unknown block is entered; this special block is implemented differently by the main method and the child methods, as we will see soon. 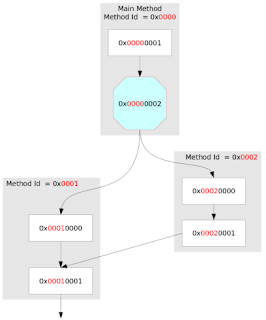 Each time a new method is added to the graph, we build a delegate for it, and store it in a special array called method_map; since we assign the method id sequentially starting from 0, we are sure that to fetch the method whose id is n we can simply load the n-th element of the array. Each child method returns a block id specifying the next block to jump to; after its execution, we assign the return value to the blockid variable, and jump again to the dispatch block, which will jump again to the appropriate block. Keeping this in mind, it is straightforward to implement the jump_to_unknown block of children methods: it is enough to return the target block id to the caller, and let its dispatch loop do the right thing. If the caller is also a child method, it will return it again, until we reach the dispatch loop of the main method, which will finally do the jump. In theory, we could implement things differently and jumping directly from a child method to another one, but in that case the call stack could grows indefinitely in case of a tight loop between two blocks residing in different methods. To implement the dispatch block we can exploit the switch opcode of the CLI; if the .NET JIT is smart enough, it can render it using an indirect jump; overall, jumping to a non-local block consists of an indirect function call (by invoking the delegate) plus an indirect jump (by executing the switch opcode); even if this is more costly than a simple direct jump, we will see in the next section that this not the main source of overhead when following a non-local link. Obviously, the slow dispatching logic is needed only when we want to jump to a non-local block; if the target block happens to reside in the same method as the current one, we can directly jump to it, completely removing the overhead. Moreover, the dispatch blocks are emitted only if needed, i.e. if the parent graph contains at least one flexswitch; graphs without flexswitches are rendered in the obvious way, by making one method per graph. Jumping to the correct block is not enough to follow a link: as we said before, each link carries a set of arguments to be passed from the source to the target block. As usual, passing arguments across local links is easy, as we can just use local variables to hold their values; on the other hand, non-local links make things more complex. The only way to jump to a block is to invoke its containing method, so the first solution that comes to mind is to specify its input arguments as parameter of the method; however, each block has potentially a different number (and different types) of input arguments than every other block, so we need to think of something else. An alternative solution could be to compute the union of the sets of input arguments of all the blocks in the method, and use this set as a signature for the method; this way, there would be enough space to specify the input arguments for every block we might want to jump to, each block ignoring the exceeding unused parameters. Unfortunately, all the children methods must have the very same signature, as they are all called from the same calling site in the dispatch block of the main method. Since the union of the set of input arguments (and hence the computed signature) varies from method to method, this solution cannot work. We might think to determine the signature by computing the union of input arguments of all blocks in the graph; this way, all the children methods would have the same signature. But as we said above, the graph grows new blocks at runtime, so we cannot determine in advance which set of input arguments we will need. Since the fields are arrays, they can grow as needed to contain any number of arguments; arguments whose type is primitive are stored in the ints or floats array, depending on their type; arguments whose type is a reference type are stored in the objs array: it's up to each block to cast each argument back to the needed type. when reading, the same bound-check is performed for each argument read; moreover, for each value read from the objs array we need to insert a downcast. To mitigate the performance drop, we avoid to allocate a new InputArgs object each time we do a non-local jump; instead, we preallocate one at the beginning of the main method, and reuse it all the time. Our benchmarks show that passing arguments in arrays is about 10 times slower than passing them as real parameter of a method. Unfortunately, we couldn't come up with anything better. For each case, we store both the triggering value and the corresponding delegate; the add_case method takes care to append value and c to the values and cases arrays, respectively (and resize them if necessary). The interesting bit is the execute method: it takes a value and a set of input arguments to be passed across the link and jumps to the right block by performing a linear search in the values array. As shown by previous sections, the first argument of a FlexSwitchCase is the block id to jump to; since when we go through a flexswitch we always want to jump to the first block of the method, we pass the special value 0 as a block id, which precisely means jump to the first block. This little optimization let us not to have to explicitly store the block id for the first block of all the cases. The value returned by execute is the next block id to jump to; if the value is not found in the values array, we return the default_blockid, whose value has been set before by the JIT compiler; default_blockid usually points to a block containing code to restart the JIT compiler again; when the JIT compiler restarts, it emits more code for the missing case, then calls add_case on the flexswitch; from now on, the new blocks are wired into the existing graph, and we finally managed to implement growable graphs. As we saw, implementing growable graphs for CLI is a pain, as the virtual machine offers very little support, so we need an incredible amount of workarounds. Moreover, the code generated is much worse than what an assembly backend could produce, and the cost of following a non-local link is very high compared to local links. However, our first blog post showed that we still get very good performances; how is it possible? As usual in computer science, most of the time of a running program in spent in a tiny fraction of the code; our benchmark is no exception, and the vast majority of the time is spent in the inner loop that multiplies numbers; the graph is built in such a way that all the blocks that are part of the inner loop reside in the same method, so that all links inside are local (and fast). Flexswitches and non-local links play a key role to select the right specialized implementation of the inner loop, but once it is selected they are not executed anymore until we have finished the computation. It is still unclear how things will look like when we will compile the full Python language instead of a toy one; depending on the code, it could be possible to have non-local links inside the inner loop, thus making performance much worse. Before implementing the solution described here, we carefully studied a lot of possible alternatives, but all of them either didn't work because of a limitation of the virtual machine or they could work but with terrible performances. In particular, in theory it is possible to implement non-local links using tail calls, by putting each block in its own method and doing a tail call instead of a jump; this would also solve the problem of how to pass arguments, as each method could have its own signature matching the input args of the block. I would like to explain this solution in a more detailed way as I think it's really elegant and nice, but since this post is already too long, I'll stop here :-). In theory, if the .NET JIT were smart enough it could inline and optimize away the tail calls (or at least many of those) and give us very efficient code. However, one benchmark I wrote shows that tail calls are up to 10 times slower (!!!) than normal calls, thus making impractical to use them for our purposes. Despite the complexity of the implementation, our result are extremely good; the speedup we got is impressive, and it proves that PyPy's approach to JIT compiler can work well also on top of object oriented virtual machines like .NET or the JVM. Generating bytecode for those machine at runtime is not a new idea; Jython, IronPython, JRuby and other languages have been doing this for years. However, Jython and IronPython do only a simple "static" translation, which doesn't take advantage of the informations gathered at runtime to generate better, faster and specialized code. Recently, JRuby grew a new strategy to JIT-compile only hotspots, taking advantage of some informations gathered while interpreting the code; this is still a "one-shot" compilation, where the compiled code does not change over time. To my knowledge, PyPy brings the first example of a language which implements a truly JIT compiler on top of the underlying JIT compiler of the virtual machine, emitting bytecode that changes and adapts over the time. 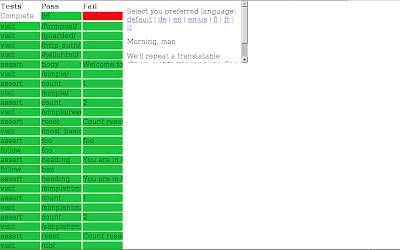 If someone knows other languages doing that, I would really like to know more. Being so innovative, the problem of this approach is that the current virtual machines are not designed to support it in a native way, and this forces us to put a lot of workarounds that slow down the generated code. The hope is that in the future the virtual machines will grow features that help us to generate such kind of code. The experimental Da Vinci VM seems to go in the right direction, so it is possible that in the future I will try to write a JIT backend for it. At the moment, the CLI JIT backend is almost complete, and all the hardest problems seems to be solved; the next step is to fix all the remaining bugs and implement some minor feature that it's still missing, then try to apply it to the full Python language and see what is the outcome. Last Friday the PyPy Status Blog had its first anniversary. Yay! After not really buying into any of this new-fangled "blog" stuff for a long time we just bit the bullet and got started. Totally surprisingly it even worked. We posted 76 post in the last year, more than one per week. By now we have more than 800 subscribers (according to feedburner), which is quite cool for a rather niche blog. Which posts did you like in particular? What sort of posts would you be interested in getting more of? Any other improvements we could make? Maciej and me visited the Maemo Summit in Berlin - a community meetup around Nokia's Linux based mobile platform. We spontaneously did a lightning talk about a first running pypy-c on Maemo and got nice feedback. We also had a nice lunch with guys from the INDT in Brazil, including Marcio Marcedo and Marcelo Eduardo. It turns out that Python is used a lot on Maemo, for example the nice Canola UI is done with it. Will be interesting to see how this shapes up in relation to the iPhone and Android. A lot of Nokia engineers were around and they announced that from October on they are going for weekly new releases of their SDK for the new Fremantle (Maemo-5) debian-based platform until the SDK becomes final - if we got this right. Funnily enough, we met Marius Gedminas from the Programmers of Vilnius - he gave a lightning talk on his impressions as a community member. We think python programmers really should go much more to non-Python centric conferences. The whole event took place at the C-Base - was a bit crammed in some of the sessions with something like 200 people attending. Just got back from Pycon UK 2008 - here are some impressions. During the 2-day conference we met many interesting people, most notably the guys from Resolver, among them William Reade who is working on IronClad -- which implements a fake python25.dll on top of IronPython. 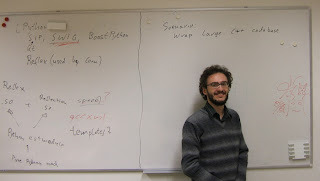 He presented some good results for Numpy in his lightning talk. This approach is surely something to follow closely and potentially use for PyPy. We also had lunch and a couple of chats with Jacob Kaplan-Moss from Django fame - he is apparently up to try use PyPy's sandboxing features for one of his projects, cool! The PyPy team is happy to announce the next sprint, which will take place in the Computer Science Department of the University of Düsseldorf, Germany. Sprinting will start on the 6th of October and go on till the 12th. Please arrive on the day before if you want to come. Topics of the sprint will be aiming at a 1.1 release and to work on integrating PyPy better with small devices. Other topics are also welcome! We will try to find a hotel with group rates, so if you are interested, please sign up soon! See the announcement for more details.